The left application panel is used to display the list of APs detected by the application (if you have a compatible adapter installed.) It also displays virtual APs if you perform predictive modeling. You can use the Group by button to group APs by band, channel, SSID, name, or custom group. Grouping by SSID is the best method in a corporate WLAN environment, where all the WLAN's APs share the same SSID. The check boxes next to the APs play a very important role: They should be used for selecting the APs you want TamoGraph to analyze. When the Selected APs mode is enabled on the tool bar, data visualizations for passive surveys include only the APs that have checked boxes next to them. Right-clicking on the AP list allows you to Select All or Deselect All APs, as well as to disable or enable the Ignore APs if max. signal is below option (see AP Detection and Placement for more information.) If the list of APs becomes too long and you prefer to not see the APs that are currently outside of the range, select Advanced => Remove Inactive APs. This will remove the APs that have been outside of the range for longer than two minutes. If the AP signal is strong enough and if a sufficient number of readings has been recorded, TamoGraph computes the AP location and places the corresponding icon on the site map. Those APs that are present on the floor plan have a small plus (+) sign in the lower right corner of their icons. The Auto-locate Access Points command allows you to reset the original estimated AP location(s) of either all or only the highlighted AP if you changed them by moving AP icons with the mouse. If an AP was not automatically placed on the site map and you want to place it there, you can drag the AP icon from the AP list to the site map. To remove it from the site map, drag the AP icon outside of it or use the Clear Access Point Locations command. See Adjusting AP Locations for more information. Virtual APs that were created by the user for predictive modeling have a small blue “V” sign in the lower right corner of their icons; such APs cannot be auto-located or dragged off the site map. When you select an AP icon on the site map, the corresponding item on the AP list is highlighted in grey color. 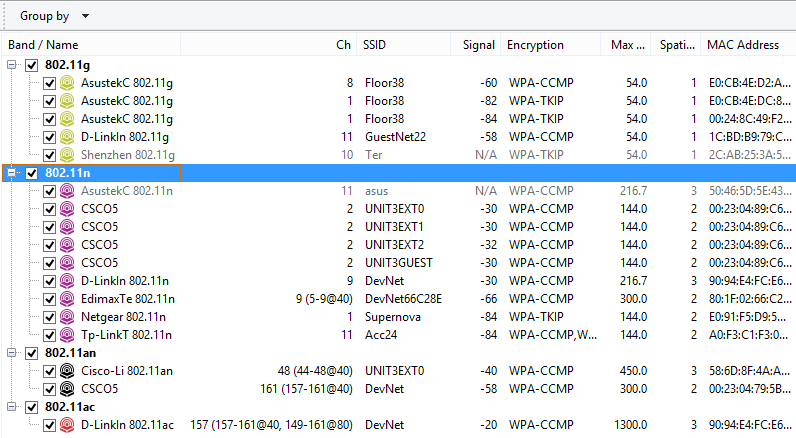 If a multi-SSID AP has been selected, multiple corresponding items on the AP list are highlighted (one per radio). When you double-click an item on the AP list, the corresponding AP icon on the site map blinks a few times (assuming that the corresponding AP icon is shown on the site map). If the AP icon is not within the site map’s visible area, the site map is automatically scrolled to ensure that the icon is visible. Sometimes, a surveyor might need to ignore one or several APs completely. This might be the case when APs do not have a fixed location, e.g., APs that are installed in elevators, or when APs are used temporarily, e.g., a laptop that is used as a hot spot. To ignore such an AP, select it on the AP list, right-click on it, and then select Advanced => Ignore this AP. The AP's MAC address (also known as BSSID) will be added to the ignore list and any packets from this AP will be discarded. The ignore list can be accessed via the Settings => AP Ignore List command of the main application menu. You can review the list and add or remove one or multiple MAC addresses. One of the possible AP grouping methods is by “Custom Group”. This method might be used if you have a grouping criterion that is not covered by the standard grouping methods, such as by SSID or by band. For example, you may want group APs by their location. Initially, APs are not assigned to any group. To create groups and assign APs to them, use the Custom Group menu. Under this menu, you can Add selected APs to an existing or new group (by “selected,” we mean the APs that are currently checked in the AP list) or Clear grouping for all or selected APs. You can also Manage all groups. When you use the Manage command, the application displays a dialog listing all APs and their membership in the groups. Initially, all APs are marked as Ungrouped. You can create new groups, rename them, delete them, and move one or several APs to any group via drag-and-drop. Note that an AP cannot be assigned to multiple groups; it can be assigned either to one group or to no group. Groups are project specific, which means that they exist only within a given project. You cannot create or manage groups when no project is open.